A few weeks ago the Fancy Friday team had a No Red/No Pink Valentine Blog Hop. I made this card for that challenge, but ended up using another card for the blog hop instead. Today's card is a little bit of a stretch for me because it is so frilly. I haven't used this much lace, ribbon, and bling on a card in a l-o-n-g time. The Timeless Elegance designer series paper is absolutely stunning and to tell you the truth, it has been sitting in my stash basically untouched. Normally, I would choose red, pink, or even yellow to color this paper, but with that being off the table for the challenge, I decided to use Mink Macaroon instead. Actually, I only used some Mint Macaroon Dotted Lace Trim. The flowers were colored with Soft Sky reinker and an AquaPainter filled with 91% Isopropyl Alcohol. You see, when you put Soft Sky ink on Very Vanilla (the background color) the slightly yellow tint mixes with the light blue to create Mint Macaroon. Color Theory 101: yellow and blue make green. To go along with the vintage feel of this card I used the My Valentine greeting from the Bloomin' Love photopolymer stamp set (#140643). I borrowed the sweet little butterfly from the Papillon Potpourri stamp set from the annual catalog. I couldn't help but feel this card was needing even MORE BLING so I hand placed the rhinestones in a swirl pattern and on the butterfly. The black lace on the top and bottom of the panel is more of the Timeless Elegance DSP. Maybe it is because I just finished binge-watching twelve seasons of NCIS, but I definitely think that Abby Sciuto would approve of this card...what do you think? LOL! I hope you and your loved ones have an amazing Valentine's Day! Hugs! Welcome back to our Fancy Friday Blog Hop. When Cindy Schuster suggested that we have a "No Red or Pink Valentine Challenge" I groaned. You've Got to be Kidding! Seriously? I could not even imagine a Valentine without those colors. But when it became obvious that she wasn't joking around, I decided to embrace the idea and just see where I landed. I have to tell you...this WAS a challenge. Since I don't have any little ones running around anymore, I decided I should focus on creating a traditional card. After all, there is no point in making this more difficult than it has to be. You probably already know that I have been playing around with watercolor on my projects lately...so I decided to stick with it and here is the card I created. I used the "What I Love" Sale-a-bration stamp set. It is designed to be used as a 3-layer stamp, but I only used the outline. Here is a quick photo tutorial of how I made this card. I used Canson XL #140 cold pressed watercolor paper. I stamped the images several times. TIP: to help get even placement, stamp the flower and the leaves together each time. Trust me, it will be easier to distribute the images evenly over the card front if you just take your time. I used a wash of So Saffron ink on the flowers, allowed it to dry, and then added a top layer of Daffodil Delight ink. The leaves are colored with an Old Olive reinker. I purchased this masking fluid at my local Walmart in the art department, but just about any brand should do the job. You may want to dedicate a brush to this technique because you probably won't be able to use it as a watercolor brush after this. I colored the background with Tempting Turquoise reinker and allowed it to dry. I added some water droplets and then used a paper towel to soak it up. Trim the panel, layer it with Basic Black cardstock and then mount it on a card base created with Heavy Whisper White cardstock. Stamp the sentiment in Versamark ink on Basic Black cardstock and heat emboss. Add a strand from the 1-1/4" jute ribbon behind the sentiment. Don't forget to complete the inside of the card. I used some scraps to create this focal point. I can't wait to see what the other Fancy Friday team members have created. Now be sure to hop on over to visit Krista and show her some love. Our theme challenge this week over at Global Design Project challenge blog is "LOVE". The other day I told you to hold on to your leftovers from the Love Blossoms Mini Treat Pouches and now I am going to show you why. This is a 5.5"x4.25" top-folding card. I die cut portions of the leftover dsp with the Scallop Framelits Die and then layered the strips to create this fun card front. I stamped the flourish from the First Sight stamp set in Blushing Bride ink and then stamped the greeting in Rose Red. I used the side scallops to line everything up perfectly and then I trimmed them off to create a 4-1/4" wide card. I hope you will check out what the other talented designers have created for this fun challenge and play along this week over at the Global Design Project Challenge Blog. That's all there is to it. Just add the embellishments of your choice, fill with some goodies & paper shreds and then brighten someone's day! That is all for today. Inge Groot is next on our blog hop so be sure to head on over and check out what she and the the rest of the ADT team have in store by clicking on the button below. Also, scroll down to bottom of this post for a list of the ingredients for today's project. Top Left: Love Blossoms DSP (140548), First Sight Stamp Set (140685/140688), Squares Collection Framelits (130921), Big Shot Die-Cutting Machine (113439), Blushing Bride Glimmer Paper (140550), Bow Builder Punch (137414), Banner Punch (133519), Garden Green Classic Stampin' Pad (126973), Blushing Bride Classic Stampin' Pad (131172), Whisper White Cardstock (100730), Linen Thread (104199), Regals Designer Buttons (130029), Mini Glue Dots (103683), Tear & Tape Adhesive (138995). Center Left: Love Blossoms DSP (140548), First Sight Stamp Set (140685/140688), Squares Collection Framelits (130921), Big Shot Die-Cutting Machine (113439), Blushing Bride Glimmer Paper (140550), Banner Punch (133519), Rose Red Classic Stampin' Pad (126954), Blushing Bride Classic Stampin' Pad (131172), Whisper White Cardstock (100730), Linen Thread (104199), Subtles Designer Buttons (130030), Mini Glue Dots (103683), Tear & Tape Adhesive (138995). Bottom Left: Love Blossoms DSP (140548), First Sight Stamp Set (140685/140688), Squares Collection Framelits (130921), Big Shot Die-Cutting Machine (113439), Blushing Bride Glimmer Paper (140550), Hexagon Punch (130919), Rose Red Classic Stampin' Pad (126954), Blushing Bride Classic Stampin' Pad (131172), Whisper White Cardstock (100730), Love Blossoms Embellishment Kit (140551), Tear & Tape Adhesive (138995). Top Right: Love Blossoms DSP (140548), First Sight Stamp Set (140685/140688), Squares Collection Framelits (130921), Big Shot Die-Cutting Machine (113439), Rose Red Classic Stampin' Pad (126954), Blushing Bride Classic Stampin' Pad (131172), Whisper White Cardstock (100730), 1-1/2" Circle Punch (138299), Linen Thread (104199), Clothespins (133764), Whisper White 1/2" Seam Binding Ribbon (134573), Neutrals Designer Buttons (130031), Mini Glue Dots (103683), Tear & Tape Adhesive (138995). Bottom Right: Love Blossoms DSP (140548), First Sight Stamp Set (140685/140688), Squares Collection Framelits (130921), Big Shot Die-Cutting Machine (113439), Blushing Bride Glimmer Paper (140550), Rose Red Classic Stampin' Pad (126954), Blushing Bride Classic Stampin' Pad (131172), Whisper White Cardstock (100730), Label Bracket Punch (132153), Subtles Designer Buttons (130030), Whisper White 1/4" Cotton Ribbon (134567), Mini Glue Dots (103683), Tear & Tape Adhesive (138995). Welcome back to another 2015-16 Stampin' Up! Artisan Design Team blog hop. I am so excited to be selected to be on this team of 20 talented demonstrators from around the globe. Since our team is global, you may find it helpful to install Google Translate so that you can read what everyone has to say. If you are already going through the hop, you should have just arrived here from Cindy Schuster's blog and when you leave here you will travel on to visit Inge Groot. I am so excited to finally get the opportunity to use some of the new product in the upcoming Occasions Spring Catalog. As much as I love Christmas, I am ready to move on to creating projects for spring. I am swooning over the new Love Blossoms DSP Stack (140548). With 24 different 6"x6" patterns, there is something for just about everyone. I am just going to give you fair warning...I am going to be using this DSP a lot! Here I created a hanging triangle box by using the Cutie Pie Thinlits. I cut off the top flaps and added a handle. It is just perfect for giving to my sweetie or even to a friend for Valentine's Day. I used the box die and traced the front and sides on the backside of the dsp. Then I hand cut those pieces, added some machine stitching and distressed everything with Early Espresso ink for a romantic, vintage look. I punched two scallop circles (2-3/8" & 1-3/4") for each scallop for the rosettes. The button is threaded with a strand from the White 1-1/4" Jute Ribbon. The word love is stamped in Rose Red ink with the First Sight stamp set. I also used the flourish stamp from the same set to create a subtle background using Blushing Bride ink. I created a handle from some Blushing Bride cardstock and added stitched on some coordinating dsp. I punched a hole in each side of the box and attached the handle with some Candy Dot Brad Bases. I added pearl basic jewels to the top of each brad. I cut a 36" piece of Jute Ribbon, cut it into two halves and then made a bow for the handle. Well, that is all for now. Inge Groot is next on our blog hop so be sure to head on over and check out what she and the the rest of the ADT team have in store by clicking on the button below. Black, white, and gold are very trendy in the paper crafting world, so I thought it would be fun to use the supplies I had on hand to create this fun Valentine's Day card. I started with a 5.5" x 4.25" Basic Black card base with a top fold and covered the front with some striped paper from the Stacked with Love DSP Stack (#137779). I tied on some Metallic Gold Baker's Twine (#132975) and tied it in the center. To make the focal point of the card I die cut some Gold Glimmer Paper with the fourth largest heart in the Hearts Collection Framelits and then die cut the sentiment out of the center with a die from the Label Card Thinlits (#133479). I cut the sentiment again out of Whisper White cardstock and again from some Red Glimmer paper. I placed the white die cut words in the negative space of the heart and trimmed down the red heart so that it would be an exact match. I used dimensions on the top and bottom of the heart to raise it up above the twine and to hide the knot. Finally, I punched several small hearts from gold foil cardstock using the small heart on the Owl Builder Punch and placed them randomly on the card front. I still want to come back and tell you more about Orlando, but with Valentine's Day only a week away I wanted to get this card posted first. We have somewhat of a tradition at our house...for the past few years I have made a Valentine's Day banner for the china hutch in our kitchen. It's fun and with all of the great products available in the Stampin' Up! 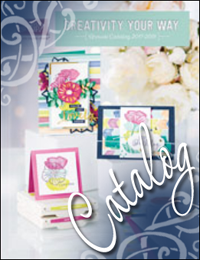 spring mini catalog, it is pretty easy to do. I used the Banners Thinlits dies to cut shapes from Chalkboard Paper (#137786) and the Stacked with Love DSP (#137779). The heart banner pieces are made with the Sweetheart punch. I stamped the frames and sentiment with the "Because You Care" Hostess set (#137132) in Whisper White ink and then heat embossed it with White embossing powder. The "L-O-V-E" letters are from the new photopolymer set "Sophisticated Serifs" (#137131). I punched the holes with a Crop-a-dile hole punch and strung everything together with baker's twine. So what are you waiting for? Show your family the love with a banner made with Stampin' Up! products!